From the last few Math Brain Teaser posts, We are posting Mathematics Picture Puzzle Equations with pictures. In these math riddles one has to solve the Mathematical Equations using the pictures instead of usual variables. Today again I am posting similar mathematics picture riddles as these puzzles are loved by many people. 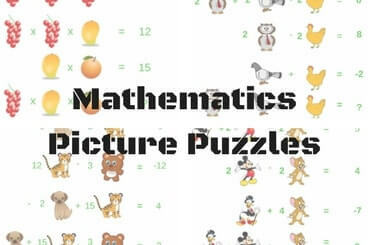 In these Picture Puzzles, maths equations has been given. However in each of the equation, Maths variable has been replaced with pictures. Solve these picture puzzle equations to get the value of the last equation. Answers to these math riddle equations are given at the end of this post along with detailed explanation. Please do write you answers and feedback in the comments section of this post. 1. Kids Math Equations Riddles with Answers: Here are some more interesting Kids Maths Equations in which you have to solve it for a particular symbol. 2. Circle Puzzle Questions for students with answers: It contains the Maths Circle Puzzles in which 5 numbers are given around the Circles grouped together with a pattern. Your challenge is to find this pattern and then solve it for the missing number. 3. Brain Challenge Questions With answers and Explanation: Here are very interesting 5 brain challenging questions which will test your logical reasoning and Maths skills. 4. Algebra Images Matchsticks Puzzles with answers: How good are you with Algebra? Try out these simple Algebra Matchstick Maths Puzzles in which you have to correct the equation by just moving only one Matchstick. Hidden answer of these math picture puzzle riddles are given below. Do select the text between the numbers to read the corresponding answer. G . M . O= 30. Substituting Value of D in eq 3.